On a warm, clear Friday morning, B.C. Ferries Coastal Inspiration captain Behzad Safarizal looks out at the busy waters ahead of the Duke Point ferry terminal. Boats of all shapes and sizes criss-cross the pathway of the 160-metre German-made vessel, which has just begun a more-than-two-hour journey to Tsawwassen. “What’s this guy doing? He’s all over the place,” Safarizal suddenly says to a member of his crew as a recreational boat crosses the path of his ship. With Seaspan, three cargo-ship terminals and a cruise ship terminal nearby, the waters around Duke Point, Gabriola Island and Protection Island are some of the busiest to navigate, according to Safarizal, who has been a captain with B.C. Ferries for five years. “This is a busy strait of water … but all of our crew are trained to deal with it and we have a plan and we follow our plan,” he said. Dealing with recreational boats is just one of the many activities that goes on behind the scenes every single sailing. Late last month, the Nanaimo News Bulletin and Black Press Media was given exclusive access onboard the Coastal Inspiration. B.C. Ferries employees showed reporter Nicholas Pescod and videographer Arnold Lim what goes on behind the scenes during a typical sailing. The Coastal Inspiration is part of the ‘Coastal class’ of ships operated by B.C. Ferries, delivered a few years before the 2010 Winter Olympics. “I love showing off this ship, it is a big part of my life,” said Cpt. Robert Nelson, senior master of fleet operations for the Coastal Inspiration. Anyone who has ever taken the Coastal Inspiration may have noticed that desite having seven decks, there is no deck three button on the ship’s elevators. That’s because, as Nelson explains, deck three doesn’t exist. At least not yet. “Deck three was going to be a platform deck. It was an option when we were going to design the ship that we would be able to take cars on the main deck on two levels,” Nelson said, adding that they designed the Coastal Inspiration in a way where deck three could be installed and used as a car deck in the future. The summer season is far and away the busiest time of the year B.C. Ferries, which means a lot more mouths to feed for Catherine Schmidt. Head chef with B.C. Ferries, Schmidt said the last sailing in the morning and the first two sailings in the afternoon are usually the busiest. “We are definitely busy at this time of the year,” she said. When it comes to food, the staff on board the Coastal Inspiration serves up a lot of it. B.C. Ferries, which offers White Spot meals during afternoon sailings, estimates that it serves mor than 500 customers per day on the Duke Point route alone. Schmidt couldn’t say exactly how many pounds of food kitchen staff go through in a day. But she did say it includes about 10 boxes of hash browns and and anywhere from 15 to 20 boxes of fries. “We get about eight to 12 pallets of food per day,” she said. The hardest item on the menu to cook can vary according to Schmidt. What makes B.C. Ferries’ onboard restaurant unique from a typical White Spot is that B.C. Ferries staff are not only trained in food preparation, but are also required to have their seafarer’s medical certificates and are trained to deal with a variety of emergency situations. “It’s not like working in a regular kitchen where it is just food, we are also here for safety and sometime safety issues arise so we get called to do that,” Schmidt said. The Coastal Inspiration has a maximum capacity of 1,600 people and is equipped with four medium-speed diesel 5,361-horsepower engines. Each engine is coupled to a 4,800-kilo-volt-ampere synchronous alternator at 6,600 volts. The ship also has two 11,000-kilowatt electric drive motors and can burn anywhere from 3,300 to 4,000 litres of fuel in a single trip. Down in the engine room a team of five B.C. Ferries engineers are responsible for ensuring the Coastal Inspiration sails smoothly each day. Robert Malinowski, chief engineer with B.C. Ferries, said the biggest challenge is working on the ship without impacting customers, which is not an easy task as the Coastal Inspiration is in service for more than 20 hours a day. Greg Jackson, first engineer with B.C. Ferries, oversees a crew of three individuals. He said although the Coastal Inspiration is 10 years old, it is still considered modern as it has far more electronics than older vessels. “There are a lot of electronic and electrics that you have to investigate and study,” he said. Jackson, who grew up in Nanaimo and previously worked as an engineer aboard cruise ships, said the Coastal Inspiration isn’t a whole lot different from the much larger cruise ships he’s worked on. When it comes to fire safety, the Coastal Inspiration is outfitted with a sophisticated fire suppression system known as Hi-Fog. 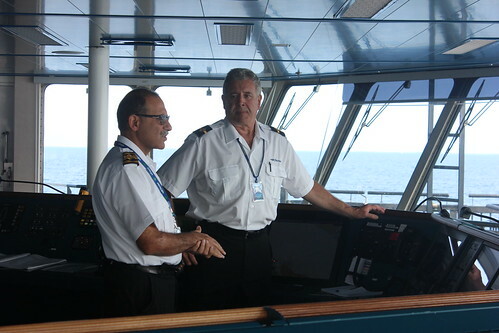 Mostafa Nateghi, senior chief engineer for Costal Inspiration, said people may not truly appreciate how much maintenance work is required for the Coastal Inspiration, explaining that engineers are working on the ship even when it’s docked. He said the Coastal Inspiration and its sister ships are extremely complicated to operate and occasionally issues do happen. “Normally the ships are very very reliable, but at times we have challenges and we have to deal with it,” he said. Since its founding in 1960, B.C. Ferries has grown to become the third-largest ferry service in the world. The company employs more than 4,800 people on approximately 470 sailings every day and estimates that than an average of 21 million passengers and 8.7 million vehicles travelled with them each year on roughly 174,000 sailings. Over the course of B.C. Ferries’ history, 58 babies have been born onboard a vessel according to Deborah Marshall, B.C. Ferries executive director of public affairs, who said when that happens the child automatically receives free ferry rides for life. The most common route for births is Port Hardy to Prince Rupert. “We’ve even had one baby born on the Gabriola run,” Marshall said, adding that the child was named Quinsam, in honour of the ship it was born on. Of course, there has been no shortage of items from clothes to retainers to wallets to cellphones that have been accidentally left onboard by passengers over the years. Dimond, senior chief steward with B.C. Ferries, said passengers and crew often find items. “We get a lot of passengers and crew that turn in wallets, which is great. We had a wallet that had been lost for a couple days. It managed to get stuck way down in the seats on deck five and a passenger brought it up and it still had everything inside,” she said. Meanwhile, Marshall said one of the strangest items she can recall being left behind was a box with an unexpected destination. “A lost and found item came off the ship and it was a plastic bag with a box inside … and the sticker on the outside of the box said Vancouver crematorium,” Marshall recalled. One thing B.C. Ferries staff have witnessed over the years is that occasionally individuals will spread the ashes of their loved ones at sea, but don’t factor in which way the wind is blowing. “We’ve had that happen where people have not notified anybody and gone to the outside deck and the wind, of course, as you can imagine, it blows the ashes all over car windows,” said Dimond. Surprisingly, the No. 1 complaint received by B.C. Ferries is not the fare prices, but the poor onboard WiFi service. However, B.C. Ferries is planning to roll out a new redesigned and mobile-friendly website very soon, according to Marshall, who said the corporation is looking forward to the update. And for those wondering whether former MLAs still get to ride on B.C. Ferries for free, Marshall said that isn’t the case. “Any MLA or government personnel would just pay for their fare,” she said.